The proverb says that necessity is the mother of invention. Yet for the team who founded ready to BRANDS, it was impending motherhood — and a rare and debilitating condition associated with it — that necessitated their invention of ready to EASE, a nausea relief product that can be taken as an ice pop or liquid shot. The power of Mark Muller’s creative response to a critical situation — and the simple appeal of his organic, all-natural product — helped ready to BRANDS win a highly competitive Pitch Slam, beating out eight other outstanding business startups at FamilyFarmed’s Good Food Financing & Innovation Conference in June. The win netted ready to BRANDS a prize package valued at $15,000, with a cash prize plus in-kind consulting and other business services from Pitch Slam sponsors Smoketown Strategy & Innovation, Creative Alignments, NewPoint Marketing, and KemperLesnik. 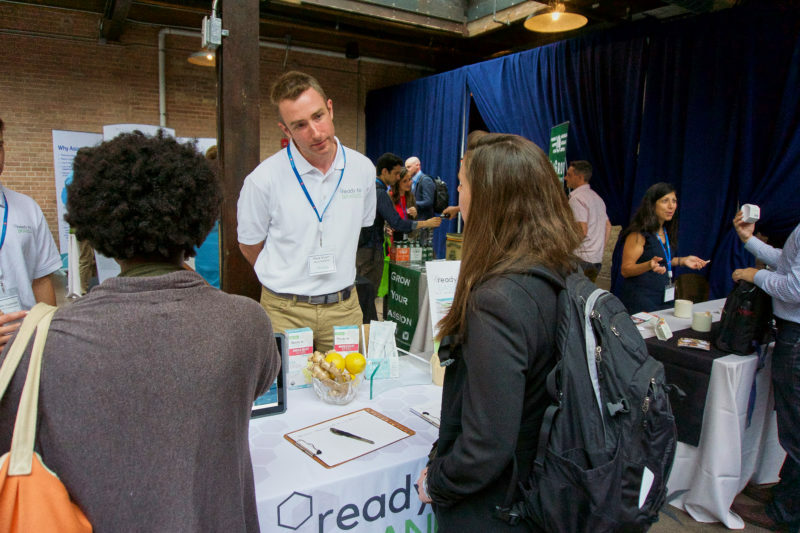 It was another step forward for ready to BRANDS, which in April was one of eight competitively selected businesses that graduated in the fourth cohort of FamilyFarmed’s Good Food Accelerator — which at its founding in 2014 was the first such entrepreneur development program focused on locally and sustainable produced food. One of the biggest benefits of the Accelerator is its expansive network of industry leaders acting as mentors. And Mark Muller credits mentor Mike Schopin of Zenfinity Capital LLC with steering the startup company in bold new direction, including a full rebranding and a major broadening of the market for its initial anti-nausea product, which originally was targeted narrowly to pregnant women with morning sickness. The application period for the Accelerator’s fifth cohort launched on Aug. 1 (with a Sept. 13 deadline), and the selected companies will begin the six-month intensive curriculum in November. Muller said there are many reasons why entrepreneurs with promising early-stage businesses should consider the program. “Connections across the entire supply chain. Connections with distributors like UNFI, we’re in the process of on-boarding for their ‘Next’ program right now. Things like that really do accelerate your growth. The right brokers and attorneys, pretty much anyone and everyone you would need to be in touch with to do this right, the Accelerator has made these connections,” Muller said. While the team members at ready to BRANDS are enjoying the first flush of success for their company, it evolved from a very scary juncture of the Mullers’ lives. Mark Muller was working in finance in Melbourne, Australia when his wife Meagan, then pregnant, developed a severe case of Hyperemesis Gravidarum, which Muller describes as “100x morning sickness.” He said extreme nausea, vomiting and dehydration resulted in Meagan losing about 20 percent of her body weight within the first month of this condition setting in. With ready to EASE, the company lets nature do the heavy lifting. In fact, the product is loaded with all-organic ingredients, some of them widely regarded as superfoods: organic coconut water, sea salt, ginger, B6 and B vitamins and wildflower honey. The positive impact on Meagan’s health got the couple thinking about how they could share their new-found knowledge. Mark ultimately decided to make it a business after returning to the Chicago area (he grew up in Evanston), and things really took off after he and his company were accepted to participate in FamilyFarmed’s Good Food Accelerator, an entrepreneur development program that provides a six-month curriculum, mentorship, networking opportunities and connections to investors. When their Accelerator term began in November 2017, their company was pre-production. 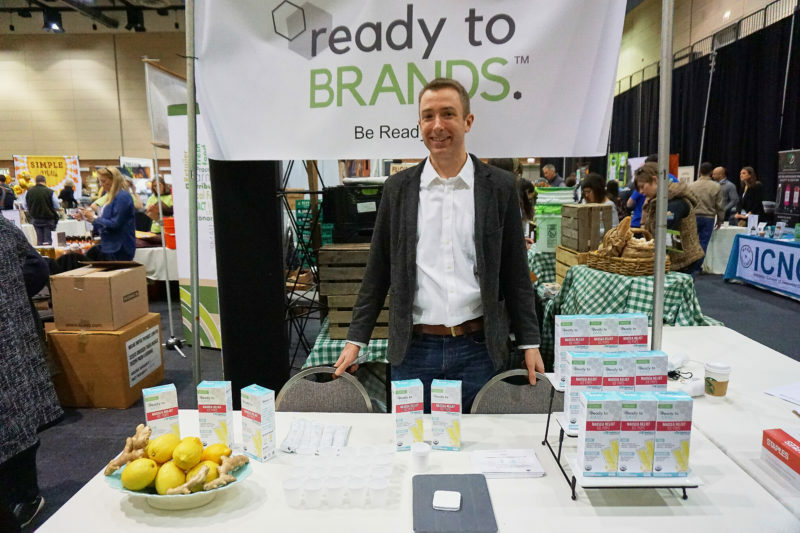 Within a few short months, they re-branded to ready to BRANDS, completely redesigned their packaging, went into production, and unveiled the product at FamilyFarmed’s 14th annual Good Food EXPO, held March 23-24, 2018 at Chicago’s UIC Forum. The company is now starting to partner with hospitals in the Chicagoland area and is in the early stages of building a foundation that will contribute a percentage of all profits to medical research, as part of its larger vision to make a meaningful impact in the world and to further help those who need it most. Smoketown Strategy: Consultation for ready to BRANDS to find new consumers for existing products or expand their innovation pipeline, plus a $1,500 credit toward further design and development. Creative Alignments: 10 hours of employee recruiting consulting to build their company. KemperLesnik Public Relations: 20 hours of person-to-person consultation to help identify an effective PR campaign. ready to BRANDS is one of many Good Food Accelerator graduates who have experienced growth and progress as a result of their participation. If you are an entrepreneur who would benefit from this entrepreneur development intensive, do not miss the opportunity to apply by the Sept. 13 deadline. This entry was posted in Uncategorized and tagged Creative Alignments, FamilyFarmed, Good Food Accelerator, Good Food Expo, Good Food Financing &Innovation Conference, KemperLesnik, Mark Muller, Mike Schopin, NewPoint Marketing, Ready To BRANDS, Smoketown Strategy and Innovation, Zenfinity Capital. Bookmark the permalink.